In a whizz-bang-flash the latest school year came to a close here yesterday. The year in which my girl started formal school, and my boy eased gently into full-time nursery. The year in which I remembered what ‘me’ time feels like. But all that was put on hold when the school herded the kids out for the last time yesterday, and Ella bounded into the room at 7am this morning with the curious early-energy that is so mysteriously lacking on school days. The summer holidays have well and truly landed. I need a large, strong, hot, black coffee. Now. How to fill this expanse of time ahead of us? When I’m around I tend to indulge the children on the first few days of holidays. They are endlessly enthusiastic and in dire need of adjusting their stimulation radar to accommodate the slower pace of non-school life. I like to ease them in gently. An arty activity felt right, but I couldn’t face the paints, not on Day One. Flushed with the success of replenishing my pasta stocks the other day, I had an different idea to satisfy their creative appetites. 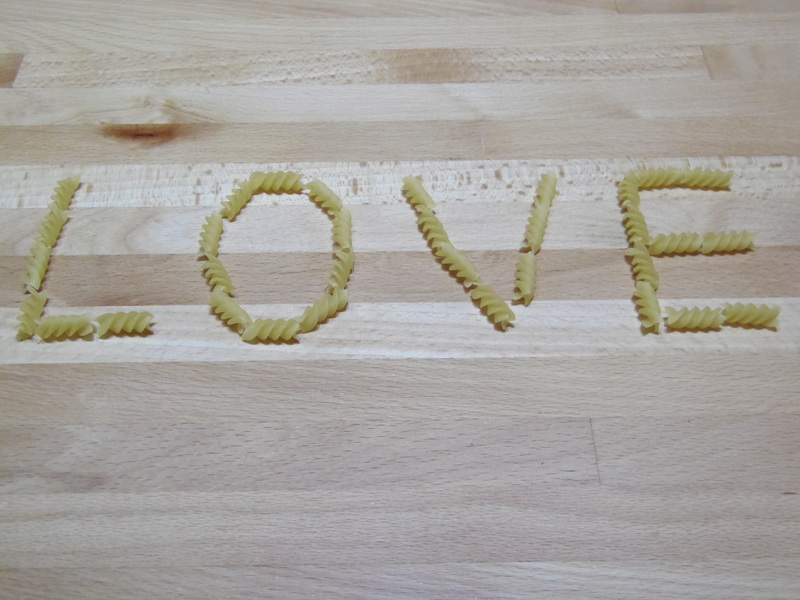 Pasta Art. I couldn’t quite cope with bursting open multiple tubs, so we applied the KISS principle and worked only with Torti (little spiral pasta shapes that are short and versatile enough to be collectively arranged into a variety of easy shapes). I filled a bowl with Torti and arranged us around it, strategically placing myself between the children to minimise any risk of competitive conflict erupting (it happens). Let the Pasta Art fest begin! The opportunities with this activity are endless. When you consider the diversity of pasta shapes available it’s possible for even young kids to be quite intricately creative. If the mood is upon them. We fiddled and made pictures, shapes and words for about half an hour before crunching alerted me to the fact that Joe was getting bored and had started eating the uncooked shapes. The clean-up is quick and easy, especially if you give each child a tray to work on. You can even create a guessing game where one child starts a pasta-make, and the others have to try to imagine what it will be. Like Pictionary without the cards and pens. I love the holidays. Juggling work and childcare is always a challenge, but taking the school-run-rush out of the mix somehow seems to bring an air of calm to the house that is the perfect environment for wild imaginations to thrive. 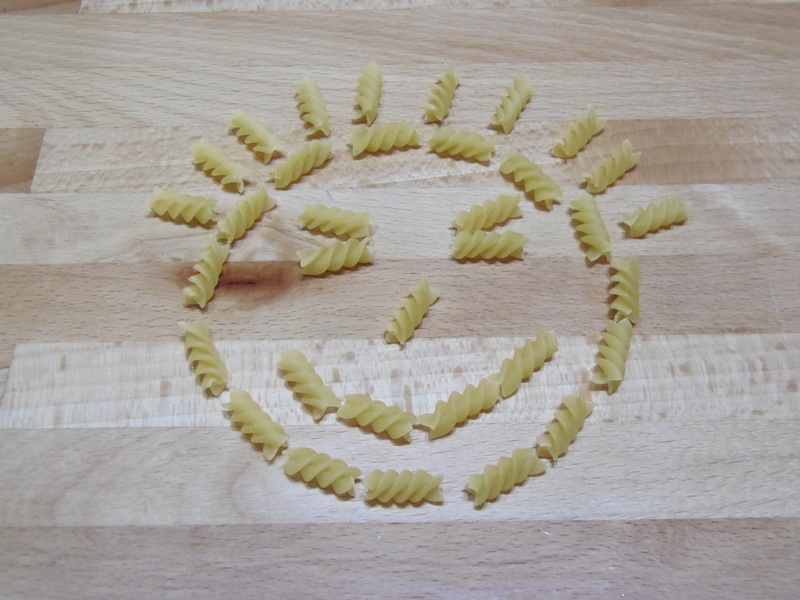 Once the Pasta Art session was complete the children were dispatched for free play while I made lunch. My Mummy ears remained vigilant for sounds of trouble about the house, but were instead assaulted only with the sounds of collaborative industry. Together the children made a pirate boat from the living room chairs, and amused themselves with walking the plank and fighting sea monsters. I smiled to myself – it so often seems to me that creative endeavours stimulate the imagination in more ways than one. 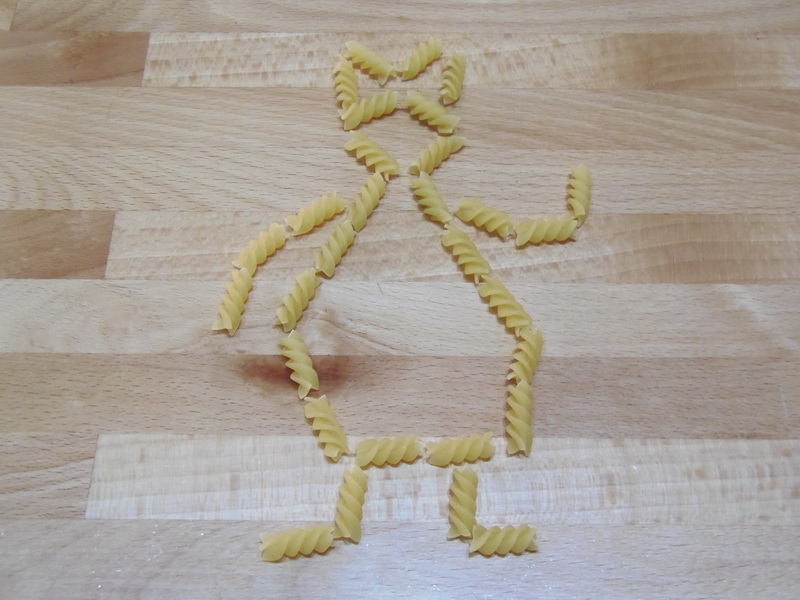 The Pasta Art session was half an hour well spent. Back in the day, in the time I like to fondly refer to as BeKaS (Before Kids and Stretchmarks), a Good Day usually involved some kind of achievement along the lines of the successful negotiation of multi-million pound deal, or timing a journey along the M6 to miss the worst of the traffic. Such was corporate life. As parent I find that nothing much has changed – I still regard a day as Good when I feel like I’ve achieved something, it’s just that my priorities have shifted a little. Yesterday was a Good Day in PoKaS world (Post Kids and Stretchmarks) – I replenished the tubs in my kitchen which house my pasta (sprials, spaghetti, penne, macaroni …). Honestly though, the completion of this simple task felt amazing. I have a bit of a fetish for buying pasta. I am physically incapable of passing the requisite aisle in the supermarket without a powerful magnetic force dragging me to face the serried ranks of wheat shapes before me, all begging me to lob them in the trolley and make a run for it. Pathetic it may be, but I’m powerless to resist the charms of the various pasta shapes, and feel compelled to ensure home-stocks remain high and with sufficient variety to make me feel like a daring cook. (Hey, look at me, I can boil three different shapes of pasta … even as I write that I know it sounds daft. As if the kids could care less anyway, as long as it’s hot and has cheese on it.) Still, we all have to get our kicks somehow. To run out of pasta would be a fail of monumental proportions. Consequently, my cupboard is stacked full of the stuff. Ages ago, when I was still firmly entrenched in BeKaS and my appreciation of time was skewed, I acquired some useful storage tubs to feed my pasta passion, and kept these replenished religiously after every shopping trip. These were Good Days too. Until December 2007 when my daughter arrived and the concept of ‘free-time’ took on a whole new meaning. Thereafter, the crinkly packets just got shoved in the cupboard in favour of nurturing my crinkly baby. I worked hard to ignore the tubs that winked spitefully at me each time I ventured in. Babies rock your world in so many ways. Like many new parents I discovered that some days just finding time to get dressed was a luxury. That was my Good Day right there. Refilling pasta tubs? Forget it. Of course, things improved with time, but the fragile family-management structure we’d achieved was disrupted again when my son arrived in early 2011. Slightly panicky, I ring-fenced a precious half-hour each week for me-time – a little space where I could have a pee and a proper shower without having to break off to stop my toddler creating murals on her bedroom wall, or unpeel my newborn from his vest after an over-enthusiastic bowel movement. So Sundays became my Good Day. For a while. That was three years ago. And yesterday, tub-filling once again became my Good Day. Life has gone full circle, and yet it hasn’t. The kids have changed my world forever and I couldn’t be happier about that. My daughter was colouring at the table; my son was engrossed in a game with his duplo. Both had batted me away when I offered to play. The independence of little people growing has entered my home. As the dust settles on the frenzy of my early parenting years I can begin to fully appreciate the relativity of time. What seems important now, may become irrelevant tomorrow. But that’s okay. I’m going to live in the moment. Good Days will come and go, but the best days will always be the ones on which my kids were born.